There is an thirst in my spirit to create work that explores the connection between the earthly and the divine. Maintaining focus in the manic world in which we live is no easy task. Making is meditation, an alignment of the soul and refocusing on the eternal. An act of devotion, my work is prayer made visible. Sitting below a canopy of naked trees, I looked up to blue sky revealed through a gap in the branches. In this moment, I made a sacred connection to trees— trees that grow tall and strong out of the imperfect earth and reach high into the sky pointing towards the heavens. Trees have become a symbol of the personal struggles between earthly and heavenly desires and a reminder of communion between the ephemeral and the eternal. 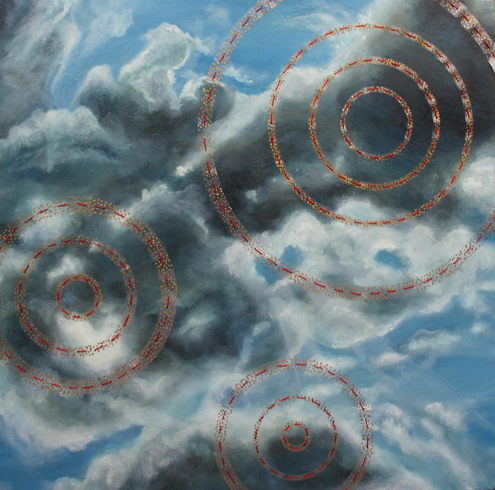 The circle has developed organically as a recurring motif in my work. Like a halo or a crown, the circle is a reminder of the celestial. It has grown to symbolize the completeness of God, his omnipresence and glory. With this visual language, I inhabit an artistic world for which I create a pictorial means of supplication.